Excessive moisture in the garage threatens the emergence ofmold and mildew on its walls, rotting wooden structural elements, corrosion and rusting of the car body and other metal parts, and on the foundation it has a destructive effect. 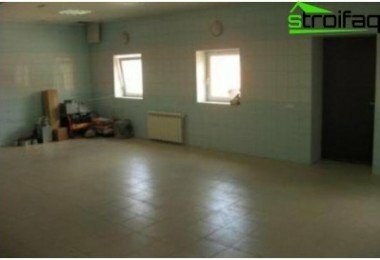 Usually, the cause of the humidity becomes poor waterproofing of the floor in the garage, which is to protect the room from the entry of moisture and prevent cracking. We consider in this article, how to carry out this phase of construction. 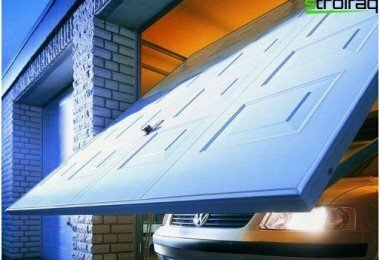 Since the construction of the garage, it must be remembered,which is much cheaper once properly perform waterproofing in compliance with all rules and recommendations, as already in the operation of facilities to deal with high humidity and at the same time eliminate all the unpleasant consequences caused by it. Improper floor waterproofing can lead to flooding of the garage or ground by flood waters, and if the building has an observation pit, then it will accumulate moisture constantly, which evaporation will result in damage to the machine parts. 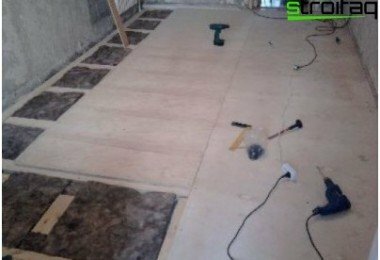 If we talk specifically about the floors, they are muchrarely undergo reconstruction than all the other elements, as this procedure is considered to be quite expensive and Finance, and the labor costs, so during the construction phase is not worth saving, it is better to buy the same quality materials that can last for a long time. To prevent the water in the garage,should be taken to the choice of materials is very responsible. In no case should not be selected for the construction of expanded clay, foam and aerocrete, as well as sand-lime brick. In principle, the bricks do not acquire any desirable since it does not refer to the waterproof material. If small moisture brick layer can further contain, when permanent backwater of groundwater quickly saturate with moisture and destroyed. That is why often used in the construction of the garage concrete. In today's market it represented a hugerange of insulating materials differing stacking technology, the cost and duration of use. Familiar in our region bituminous materials under normal use are to 10-15 years, and the new polymer waterproofing virtually no wear, which allows to lay their lifetime building. Also it offered a large number of different membranes, but when they are buying, despite all the assurances of the reliability of sellers and efficiency, it is necessary to take into account the thickness of the material may not be less than 1.5-2 mm. 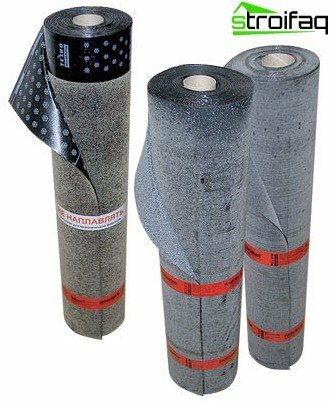 All superthin membranes are not suitable for waterproofing garage floor. 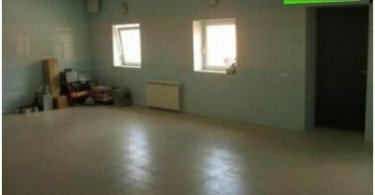 In addition, this isolation requires a lot of experience of the artist and specialized equipment, so do not even try to put it on their own. Plaster, or as it is called Obmazochnaya, is a thin layer of special solutions that prevent the penetration of moisture. Okleechnaya - rolled or sheet materials, affixed on hot mastic, such as bitumen. Penetrating the youngest kind of waterproofing. In this case, the surface being treated is impregnated with liquid repellent solutions. Powder waterproofing - is a cross between the first and third types. Once a place for construction of the garagemarked out, the whole soil in this area carefully compacted. This prevents sediment during its operation. Now this area is applied a layer of coarse sand about a meter thick, which must also be compacted. Next to the sand fit "layered" structure consisting of three layers of geotextile, while between the lower and middle need to pave the waterproofing material, and between the middle and the top - a layer of insulation. Now you can proceed to the deck floor. The best thing to do in the garage concrete floor. To increase the resistance to damage it may be reinforced, with the iron frame to cook to his design was unbreakable. The thickness of the concrete layer should not be less than 15 cm. First, consider the garage without a basement. In this case, enough to prevent the penetration of moisture into the lower part of the walls around the perimeter of the structure. For this runs horizontal waterproofing from two layers of roofing material, glued to the wall and to each other with hot bitumen mastic. This layer is required to be laid above ground level at the junction of the walls and the foundation. Before making waterproofing garage with basement, Be sure to take measures toprevent ingress of ground water and capillary moisture. To this end, the above method should be added to the vertical waterproofing exterior walls under the setting. As a rule, it is located at the bottom of the basement and grasps the outer edge exterior basement walls. One of the most effective methods of applying considered on the outside of the foundation layer of cement and processing it with hot mastic in two layers. When placing the floor of the basement belowlocation of groundwater there is a danger of flooding. In this case, the process of waterproofing the basement floor and the garage is somewhat complicated. After all of the above measures for waterproofing bottom foundation taken to concrete basement floor must align its surface and tie means. 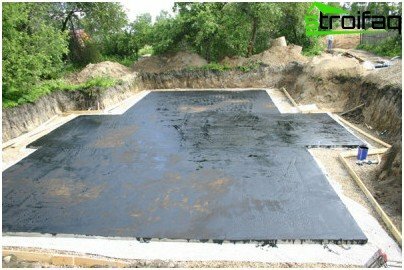 Now you need to stick the two layers of the roll or sheet waterproofing bitumen, thus it is sure to connect the hot mastic place of contact with the previously laid under garage foundation layers of insulating material. Similarly connect vertical waterproofing applied on the outer surface of the outer walls, beneath the foundation. You can then proceed to the waterproofing of the garage floor. 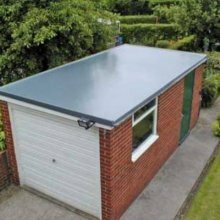 For waterproofing the floor in the garage should be takenvery seriously and it is better if it will comply with these professionals, as soon as they are able to take into account all the features of the terrain, reliably prevent reheating facilities and eliminate the high humidity in it.